Bosque de Chapultepec is a truly immense urban park. Mexico's answer to Central Park spans over 686 hectares (1,695 acres), and on any given day is brimming with people. 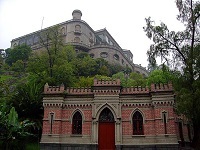 The park is home to boating lakes, monuments, a zoo, playing fields, and Chapultepec Castle. The castle stands on a hill in the centre of the park, housing the Natural History Museum and offering incredible views of the city. There's plenty to see and do in the park, but most people come to relax on lunch breaks or weekends. Kick back, grab a taco and indulge in some people-watching.